In the Catholic Church, we have a tradition of taking the name of a saint for our own Confirmation name. The saint whose name we choose serves as an inspiration to us in living out our Christian faith. It signifies that you are in the process of answering God’s call, and it can reflect a desire to model yourself after the saint whose name you have chosen. While not required, it is highly encouraged that boys select a male saint and girls select a female saint. You may want to start by going to our Saint Look-up page on this website. There are literally hundreds of quality websites and resources that list the saints. Catholic Forum has a good site in which the patron saints can be researched by location, physical condition, spiritual condition, vocation, etc. This site has profiles of each saint, which include portrait, biographical information, areas of patronage, prayers, links to related sites, readings, etc. How to Choose a Confirmation Name? Don't simply choose a name you like. Select a saint to help you live as a Christian their praying for us (intercession) and their good example (CCC 2156, 956). Take time read the lives of the saints. There are many different books on saints. The internet also has many different websites on the saints. You might start your reading with a saint that has similar interests or with one of the saints from the curriculum. Sometimes, patrons are chosen because of the day their feast day falls on (e.g., if you were born on September 4, you might chose St. Rose of Viterbo). You may want to start with your own baptismal name. 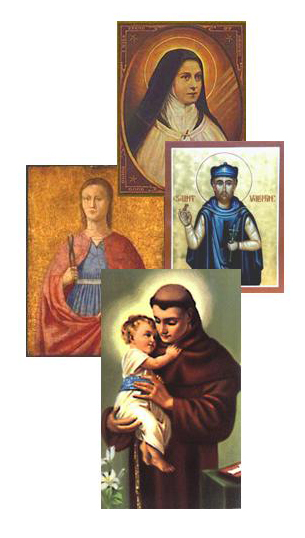 There are many different starting points for choosing a particular saint. Ultimately, the patron chosen should be someone that you want to imitate in their love for Christ and others. The Chapel has a number of saint profiles on its Saint Pages. Visit our saint pages as you conduct your research. You should pray to the saint. Ask for the saint’s intercession. Get a picture or statue of the saint, read more about the saint, etc. You will be asked repeatedly why you chose a particular saint. You should be able to explain who the saint is, how they were a faithful disciple and witness of Jesus Christ, and what they hope to imitate in their own lives as a disciple and witness. A good place to start researching saints is the Catholic Online website, www.catholic.org/saints/. There you will find an alphabetical index of saints, an index of patron saints, and a calendar with saints’ feast days, among other useful tools. We've also listed some saints on our website. « How and why did your parents choose your baptismal name? « What activities, places, people, etc. interest you? Is there a patron saint associated with any of these activities, places, people, etc.? « Which saints have their feast day on your birthday? « Which saints inspire you? Why? « When and where did the saint you are interested in live? When was he/she canonized? By which pope? « How did this saint die? Was he/she persecuted and/or martyred for his/her beliefs? « What was this saint’s occupation? « What did this saint’s mission look like? « What virtues did this saint practice in his/her life? Did this saint always practice these virtues? Did this saint experience a conversion? « How would you describe this saint’s personality? « What miracles did this saint perform? « Are there any symbols associated with this saint? What are their meanings? « In what ways is this saint a model for Christians today? « How would this saint act/react if he/she were living in today’s world? « If this saint were to complete a Confirmation project on his/her own life, what kind of project would he/she create? What is the significance of choosing a confirmation name? The name of a saint is chosen by the one confirmed and imposed by the bishop, and added to the Christian name … choose carefully! Each candidate will be expected to write a Saint Report. In addition to the written report, each candidate will present a 10 minute presentation to the class about their report. Names of saints are chosen to serve as patrons and models for those being confirmed. Candidates should choose a patron saint because of the attractiveness of their Christian life. You will be required to submit a written report of one to two pages on your patron saint (double-spaced). Saint’s name and feast day. Name or derivative you have selected to honor this special patron. Facts about your saint such as country of origin, birthplace, occupation, years they were alive, family, etc. Important events in your saint’s life that helped shape who they were and why they have been canonized. What are they specifically honored for and what are they the patron of, including how the saint is a model for Christians today. What virtues did this saint practice in his/her life? What aspect of this person’s Christian life attracted you? What prayer and/or songs are attributed to your saint? What role will this saint play in your life after Confirmation? ln several forms of Christianity, but especially in Roman Catholicism, a patron saint has special affinity for a trade or group. Patron saints can also be associated with geographical areas (depending on where they were born or where they preached). For example, St. Joseph is the patron saint of Belgium, Saint Anthony is the patron saint of Portugal and St. Patrick is patron saint of Ireland.